Our notions of community and identity shape and are shaped by local, national, and international sociopolitical contexts. The borders that frustrate and form us are alternately rigid and porous, tangible and unspoken; it can take generations to understand the ways in which cultures are fractured by (and reassemble around) them. For this issue, we turn to individuals, collectives, and organizations situated at various points along the Pacific Rim (a construct that's both an actual geographic area and a human conceit), so as to explore the inherent and metaphorical instability of places that rest on fault lines and partitions. Some instances are co-commissions; one small way of reaching across these often arbitrary boundaries. “I Go South” was published in collaboration with Ideas, Asia Art Archive’s online journal, and was co-edited with Paul Fermin. The Chinese translation can be found here. I’ve only been to the Bay Area once, in 2011. The purpose was to screen From Jean-Paul Sartre to Teresa Teng, a documentary produced by Asia Art Archive (where I work as a researcher specializing on Greater China), at UC Berkeley. The film, produced from 2007 to 2010, tells the story of how contemporary art emerged in Guangdong in the 1980s, and how the regional specificities of Guangdong 1 — like its remoteness to the political and cultural centers of China and its coastal proximity to Hong Kong, such that popular cultures and consumer goods could be accessed earlier than inland China — affected the artists here. I had one free day after the screening, and I wanted to spend it sightseeing in San Francisco. I left early and headed toward the city center — walking without a plan is one of the best things to do in an unfamiliar city. While I’ve since forgotten the exact routes I took, I vividly remember arriving in Chinatown, totally by accident. It was uncanny: I had travelled halfway across the planet and all of a sudden I was back home. Only it wasn’t the home of my present. It was more like the home of my childhood memories, or even the home of my parents’ memories — at least how I imagined them to be. I’ve had the same feeling only once before. When I was fifteen, I visited Guangzhou for the first time. Guangzhou of that time looked to me exactly like the Hong Kong of my childhood. Somehow I was brought back to the past, both now and then. It was noon. I walked into the least fancy-looking restaurant I came across, where a middle-aged lady greeted me in Cantonese with a lovely Taishanese accent (how could she tell so quickly that I was Cantonese?). I ordered steamed rice with pork ribs for $3. And it was delicious! When I visited New York, the first meal I had was a sandwich bought from a small shop on a side street. It cost $9.90, and the bread tasted like paper. As I was eating that rice with pork ribs, observing the decorations and listening to people chit-chatting, I thought: how am I not in Guangdong? Language, food, rituals, values — all remained uncannily familiar. People have been migrating from China since the late nineteenth century, and among them a large proportion have been Cantonese. Today, in most Chinese communities across the world, Cantonese food and dialects are easy to find. This brings to mind a dilemma facing today’s globalized art world: artists, wherever they work, often struggle between finding (or maintaining) their own artistic languages and themes and adapting to global ones. It’s hard to tell which direction is better, or what “better” would even mean in this context. In 1989, the Cantonese artist Yang Jiechang was invited to Paris to participate in the exhibition Magiciens de la terre, and while living there he bumped into the abstract painter Zao Wou-ki. At the time, Zao was one of the most successful Chinese artists in the West, while Yang was a new immigrant and, in Paris, an emerging artist. Zao gave Yang two pieces of advice: first, learn to speak French; second, do not hang out with the Chinese. Yang often bristles at what other people consider to be “correct.” He decided that he didn’t have to learn French, and would often mingle with fellow Chinese artists in Paris. After all, what’s interesting about walking a path whose destination has already been proven? But back to my day in San Francisco. After lunch, I made a point to visit Hou Hanru, who was then the Director of Exhibitions and Public Programs and Chair of Exhibition and Museum Studies at the San Francisco Art Institute. Hou was born and raised in Guangzhou, went to college in Beijing, moved to Paris in the early 1990s, and eventually became an influential curator. I admire Hou’s genuine respect and passion for art. He pays attention to everyday life, to its various pleasures and problems, and often produces exhibitions that try to capture these constantly changing forces of chaos and order in quotidian reality. 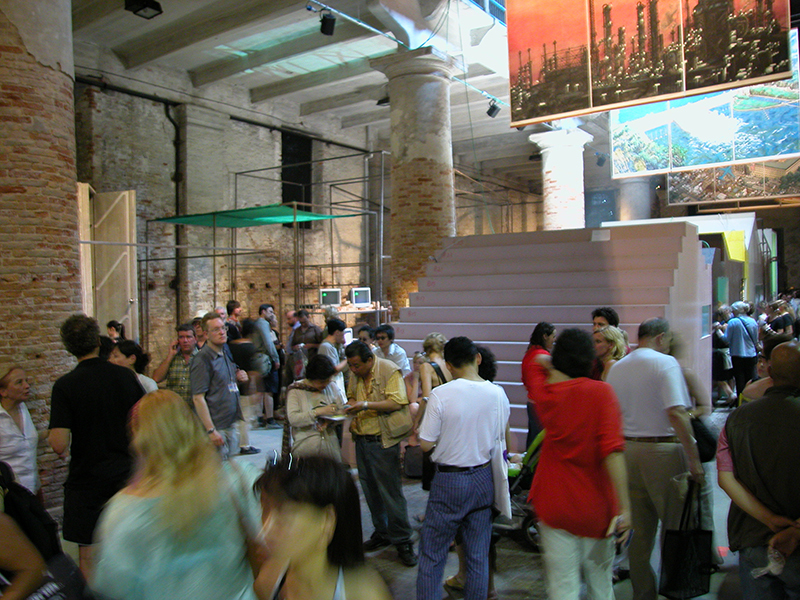 Cities on the Move (1997–99), the 4th Gwangju Biennale (2002), and 10th International Istanbul Biennial (2007) are outstanding examples of this curatorial work. But of course, Canton Express didn’t “represent” China, much less Guangdong — at best, it represented only the people who made it happen. And among them, some were Guangdong-born, some were not; some spoke Cantonese, some didn’t; some lived there, some had already left. That is to say, the community that this project suggested was very much an imagined one. What was it that grouped these people together, in the name of “Canton”? Was there a discernable commonality among their work? 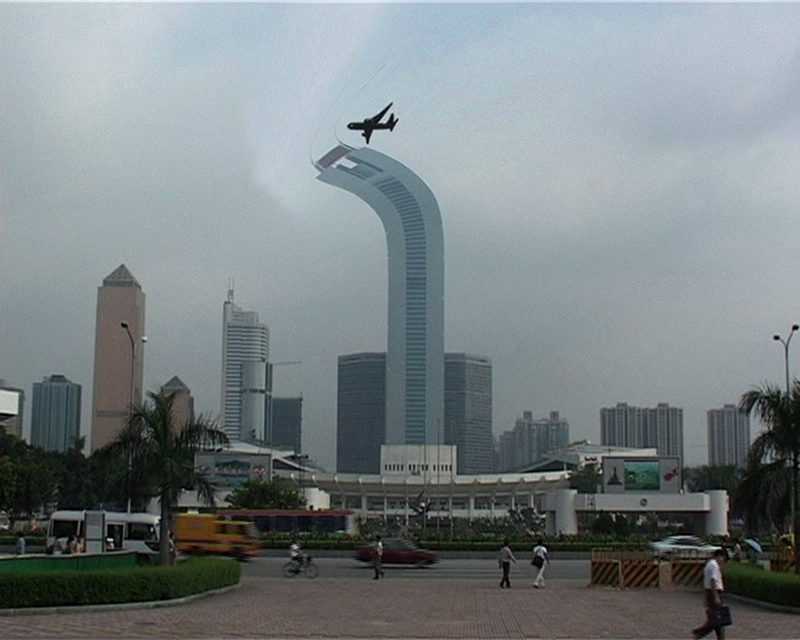 Chen Shaoxiong’s contribution to Canton Express was a video in which skyscrapers were able to change their shape to dodge terrorist attacks. 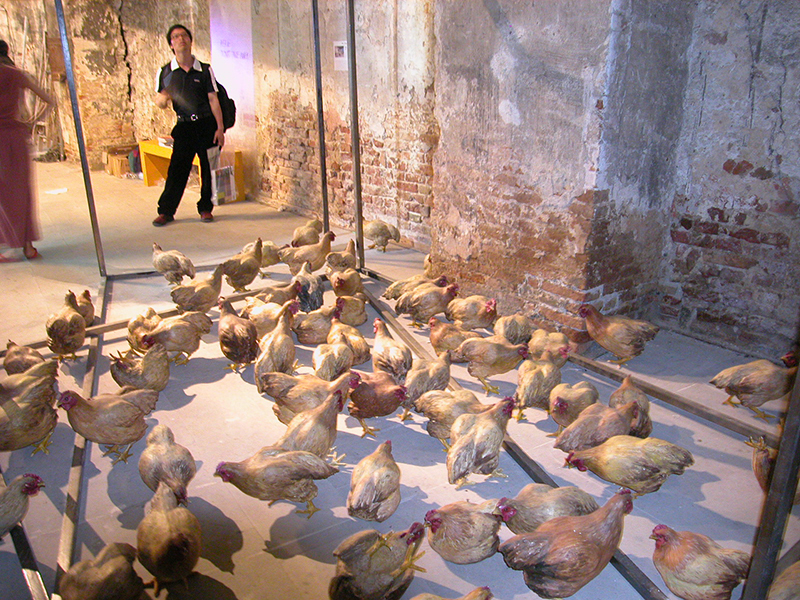 Duan Jianyu’s Art Chicken scattered nearly one hundred fiberglass (but somehow still life-like) chickens throughout the exhibition space, a referential wink at Cantonese free-range chickens. 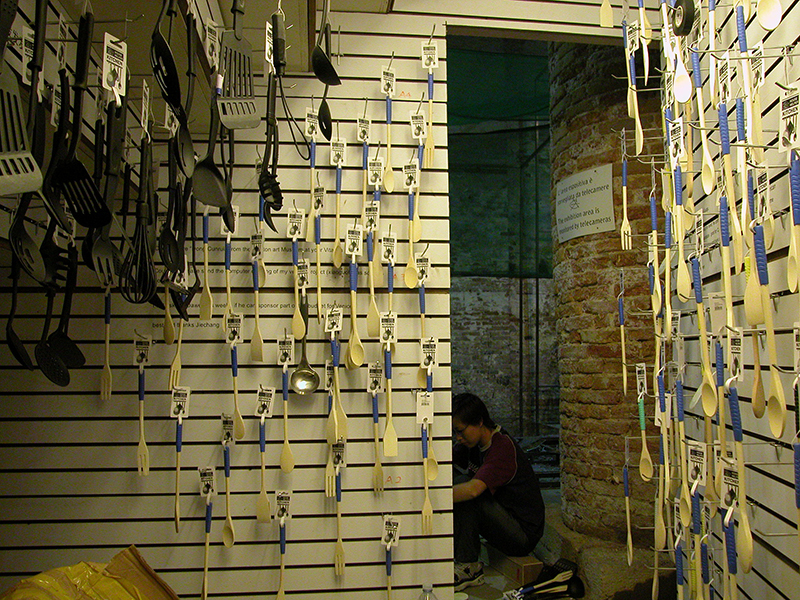 Zheng Guogu transformed his small space into a “sample room,” where he displayed a product for which his hometown, Yangjiang, is famous: kitchenware. Fragments of correspondence between those preparing Canton Express were also printed on the walls of his room. 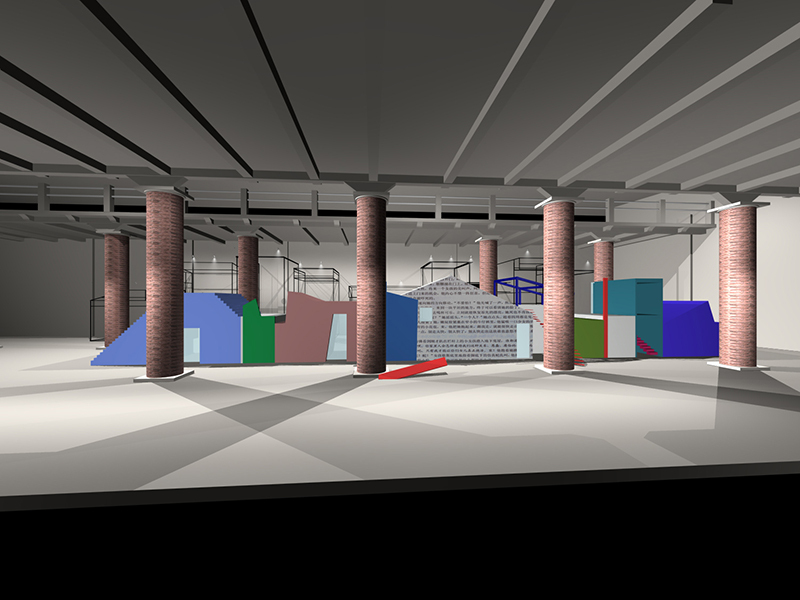 Zheng designed the main architecture of the exhibition, which was painted with several bright colors and had a strange shape; I can only say that it looked a bit like a highway overpass, with the area underneath serving as the main exhibiting space. Though small in size, it made a big noise — mostly due to Crying Landscape, an installation work by Yang Jiechang featuring five gongbi paintings that were large-size triptychs (three-by-five meters each). 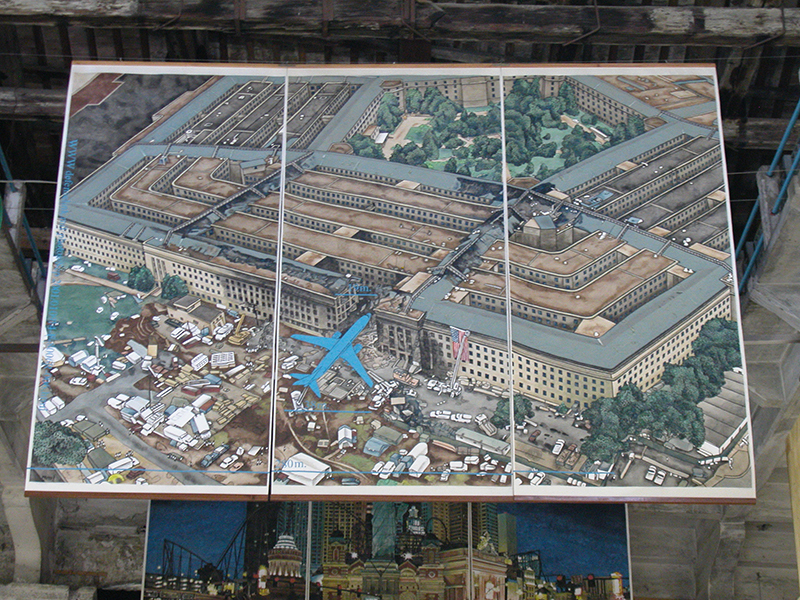 Gorgeously and meticulously made, they depicted the House of Parliament in London, an oil refinery, the Three Gorges water dam, Las Vegas, and the Pentagon under terrorist attack. The paintings were accompanied by “The Blue Danube,” but this graceful Johann Strauss waltz was programmed to be interrupted by a frightening scream from time to time. Is there a common thread that unites these works? Did they inherit anything from earlier contemporary art practices of the 1980s? Did they pass down anything to today’s Cantonese artists? These are interesting questions to think through; but I don’t believe the artists themselves ever wanted to establish a regional identity, so these sorts of inquiries don’t gain much traction with them. Still, as a researcher and Cantonese myself, I can’t help but see attributes that appear to have close relationships with the geography and culture of this place. Its political and cultural marginality since ancient times have influenced the way we understand and cherish our freedom; its subtropical climate and rich resources, especially when compared to northern China, can be said to relate to our optimism and passion for life; and the eccentric wit often seen in Cantonese art can be traced to the persistent influences of Daoism and Zen. Most Cantonese people, whether at home or in remote places, have a certain pride about who they are, and such pride can be represented even in the most vernacular and quotidian parts of life. “Canton” was an old name for Guangzhou, the capital of Guangdong province, and “Cantonese” is generally used in English to describe people from Guangzhou as well as Guangdong. “Cantonese” also refers to the Yue dialect, the major dialect spoken in Guangzhou, Taishan, Hong Kong, Macau, and some other places in the Pearl River Delta region, Guangxi province, and Chinese communities around the world. The Yue dialect is very different from Mandarin Chinese. “Guangdong,” literally “at the East of the Expanse,” is now the official written way of referring to the province, which has a population of over one hundred million people. It was also in Venice, in 1993, where the exhibition Passage to the Orient took place, significantly influencing the formation of a “contemporary Chinese art” canon in the West.